We live in a fast paced society that is always on the go. There are kids to take care of, jobs to go to, and bills to pay. And that is besides all of the constant pressure from family members and friends who always expect time and energy to be given to them for their regular social events. It is hard to keep up with it all because there are only so many hours in a day, so most people sacrifice sleep to cover the extra time that they need to make everyone happy. When fatigue sets in, they drink more caffeinated beverages. But this temporary solution ends up damaging the body even more, especially the adrenal glands. Although they are only the size of a walnut, the adrenal glands are important because they release hormones and steroids that help the body to adjust to stress. There are three stages of adrenal fatigue that a person goes through. Initially, they will feel tense and wired. As the disease progresses, they will have trouble sleeping and their health will be severely impacted. If a person doesn’t receive treatment soon enough, then according to Natural Society, they will have to go through all three stages of the disease because their body won’t be able to heal. However, even the worst cases of adrenal fatigue can be reversed if the right treatment is given. Read on for some of the best natural treatment options that are available. Because adrenal fatigue causes the body to have difficulty in regulating blood sugar levels, it is common for a person to gain weight and have trouble losing it afterwards. But strict diets that significantly limit any specific group of foods will only stress the body further. That is why Dr. Axe says that it is important to eat a healthy, balanced diet with plenty of fruits and vegetables, lean protein, and complex carbohydrates. Junk foods that are high in sugar and harmful fats are the exception though. Trans fats and sugar both increase inflammation throughout the body. Inflammation triggers a low level immune system response that can cause further damage to the adrenal glands. Olive, grape seed, or avocado oils are much healthier options for cooking meals instead of trans fats because they help keep the heart and arteries functioning at their best. They also reduce some inflammation. If possible, a person should eat foods that are strictly organic too. Pesticides and other chemicals that are commonly sprayed on fruits and vegetables will further increase the stress load on the body as it tries to both function normally and clean them out. If organic foods are not available, then it helps to use a special spray to wash off fruits and vegetables before eating them. Many people don’t realize how crucial sleep is to their health. But many studies that have been done through the years regarding an average adult’s need for a minimum of eight hours of rest a night have shown that a deficit of it has a similar effect on the body as intoxication. Neither the mind nor the body can function as they need to without sleep, so it is as if a person is going about their daily routine drunk. When a person is asleep, their body goes through a reparative cycle that helps to heal them. The mind also sorts through the activities of the day. It files away those that it considers to be important events to remember, and the rest is disregarded. So if this process is shortened on a regular basis, a person’s health and thinking will become damaged. The lack of sleep is one reason that those who have adrenal fatigue feel brain fog and have trouble remembering things. They also don’t have much energy to get everyday tasks done. If someone gets to the last stage of this disease, then they will feel exhausted even if they do get eight hours of rest because they will keep waking up throughout the night. The sleep cycle is impacted because the adrenal glands start releasing cortisol when they aren’t supposed to. The rush of this stress hormone wakes a person up frequently throughout the night. Then, they can’t back to sleep afterwards. Because of this, Underground Health says that it is crucial that a person with adrenal fatigue rests as much as they can until their body is healed. This might mean taking an afternoon nap each day or going to bed a little earlier than usual. There are several herbal remedies that work wonderfully for gently healing the adrenal glands. The best ones for someone with adrenal fatigue are those that are adaptogenic. This means that they help to reduce the body’s natural stress response despite the environment that someone is in. Adaptogenic herbs have been studied for many years as a solution for soldiers in the battlefield because they help them to continue to be in a stressful environment without being affected by it as much. The herbs improve the immune system, increase physical endurance, and decrease stress. Soldiers aren’t the only ones who can benefit from adaptogenic herbs though. They are helpful for anyone who is struggling with unavoidable stress from work or home life too. Ashwaganda and rhodiola are two of the most common herbs for adrenal fatigue. They calm the mind and body, which helps a person to sleep easier at night and function better during the day. Sometimes, licorice root is also used if stress is having an impact on someone’s digestive system, since it is soothing to the stomach and intestines. Lemon balm is also useful because it helps to lift brain fog and increase a person’s ability to concentrate throughout the day. It is often a favorite because it doesn’t contribute to fatigue or have any side effects from taking it. Although there are no known drug interactions for these herbs, it is still best that a person check with their doctor before taking them. Ashwaganda can make some people tired, so it is best that this herb be used only at night before going to bed. The other herbs have an energizing effect, which makes them more beneficial for daytime use. Inflammation contributes to the damage of the adrenal glands because it causes the body to attack healthy tissue as if it is a virus that needs to be removed. Since the adrenal glands are so small and delicate, they have a greater risk of being injured from it than other larger organs do. There are many contributors to inflammation in the body. Sometimes, a person is eating a diet of foods that are actually making them sick. Milk, wheat, and sugar are just three of the most common triggers of inflammation. Soda, coffee, and energy drinks are all high in caffeine, so people with adrenal fatigue frequently gulp down several cups of them a day to keep going when they feel tired. But they all have acid in them that increases inflammation in the body. To heal inflammation, caffeinated drinks that are high in sugar should be avoided. And a person should have testing done to determine if they have any food allergies that are contributing to their condition. If someone has consumed acidic drinks for many years, then they might consider taking a capsule of baking soda twice daily to correct the condition. It also helps to add a little turmeric to each meal that is eaten. All it takes is one or two spoonfuls of this spice a day to lower inflammation in the body. And as an added bonus, the less inflammation that you have, the less chance that there is for heart disease and cancer to occur. It is easy to recommend that a person lower the amount of stress in their life, but applying this is a little more difficult because it requires someone to say “no” more often. 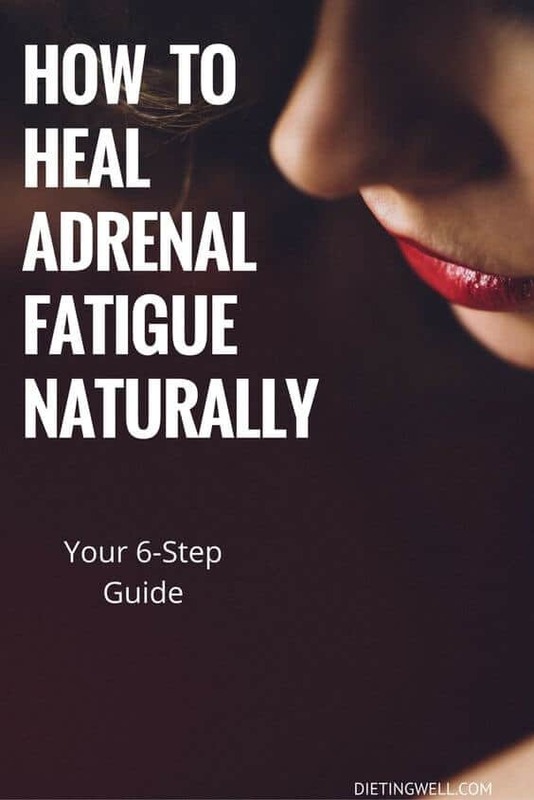 The main contributor of adrenal fatigue is the body being exhausted from being pushed for too long though. So to heal it, one must reduce their daily activities that cause them stress and start taking time to relax more. Instead of volunteering to handle lots of social functions or special assignments at work, it is best to choose only one at a time. Long hours at the office are not very productive anyways. The more tired that someone is, the more difficult it is for them to concentrate on doing a task effectively. Taking a walk daily is one of the best ways to lower stress because the activity helps to burn up any nervous energy that someone has, so they can sleep better at night. It also boosts mood levels considerably. Walking also helps the body to flush out toxins and waste that can be contributing to inflammation. Meditation has been proven to lower stress too, and it takes just ten minutes a day. All a person has to do is relax in a quiet room, while they focus on their breathing. If any intrusive thoughts should occur, they should be gently pushed away. When a combination of daily walks and meditation is used, cortisol levels will drop considerably because the adrenal glands don’t have to stay active so often. This alone helps heal adrenal glands considerably. Most health experts advise people to never skip breakfast because the body needs to be refueled after going for many hours without anything to eat. However, this doesn’t work for someone with adrenal fatigue. When the adrenal glands are not functioning properly, weight loss is next to impossible because blood sugar levels are not stable. The muscles store several hours of a sugar supply in them that are used up first as an energy source. After this, fat is used for energy. In order to lose weight and feel better, a person with adrenal fatigue has to make sure that their body burns fat by waiting a little longer to eat in the morning. So they must fast for 12 hours each day. This also helps to prevent cortisol spikes from occurring because when a person waits this long to eat, the liver will release glucose. And in order for the liver to be able to release glucose, it needs cortisol. The more cortisol that is used, the less stressed the adrenal glands and the body will be. As you can see, there are many ways to heal your adrenal glands naturally. These methods are all inexpensive and safe, so there is no reason to worry about side effects occurring from them. But they will work the best for a person with adrenal fatigue if they are all used together. You don’t have to do them all at once though. Start out by trying just one or two of them at first. Then, add in the other things slowly. That way, you won’t feel so overwhelmed by so many changes. The first thing that should be considered is getting more rest, since it will allow the body to heal itself more easily. Be sure to go to bed at an earlier time though. Cortisol levels naturally spike late at night, which can make it harder to fall asleep. If you have the symptoms of adrenal fatigue, then it is best to go to an endocrinologist for testing to be sure. The testing for this disease is easy and painless. The doctor will simply collect your saliva periodically throughout a day to check your cortisol levels. Occasionally, people who suspect that they have this disease will buy saliva test strips over the internet to try to diagnose themselves, but this is a bad idea. Adrenal fatigue can be a sign of other more serious diseases, so don’t wait too long before you get help. This disease will only get worse over time, which can have a significant impact on a person’s life and health.